New Orleans might have beads and exposed flesh, but Italy has oranges and black eyes. 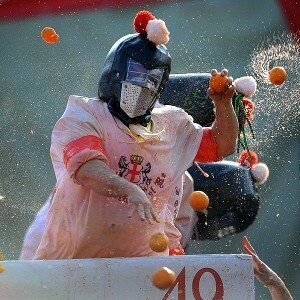 Sunday is the start of the Battle of the Oranges, a three-days-long food fight in Ivrea, a small city near Turin, which hosted the 2006 Winter Olympics. Just like Mardi Gras, the Battle of the Oranges is a wild pre-Lent carnival that culminates on Fat Tuesday. But while beads are the prize in New Orleans, in Ivrea, the reward for a battle well fought is a black eye. Marco Leonardi Battle of the Oranges: 4,000 players, many bruises. "It was really cool," said Daniel Lauriola, a 17-year-old American living in Ivrea with his family. "When I went back to school the next day I was kind of like a celebrity." Said his mother, Cathy Linsenmayer: "It's cold in February, so the oranges are hard and can really hurt. And for Italians, getting a black eye is a badge of honor." More than 100,000 red beret-clad spectators watch the nearly 4,000 participants, who each hurl the equivalent of 220 pounds of oranges. Lauriola's family is part of the Mercenaries, one of the teams that takes part in the battle, which commemorates a popular rebellion sparked by Violetta, a 12th century commoner who chopped off the head of a tyrannical lord who asked her to submit to the custom of giving her virginity to him on her wedding night. The city trucks in 400 tons -- that's about the weight of 50 African elephants -- of oranges for the event. Nine "foot" teams, representing the rebellious commoners, compete against dozens of eight-person teams on horse-drawn carriages, symbolizing the tyrant's guards. The carriage teams ride into a piazza and are immediately under siege. They wear medieval helmets but each carriage-team member competes for just one day, because after a few hours their arms are completely covered in bruises. Each foot team is assigned to "defend" a different piazza and at the conclusion of the battle, judges award prizes based upon throwing ability, costumes and fair play. By the end of Fat Tuesday, the streets are a mess and school kids are too sore to raise their hands in class. "You have to come to Italy to see this," says Lauriola. "The streets are filled with orange juice."